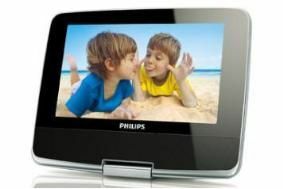 Philips unveils 'two in one' portable DVD player | What Hi-Fi? That means the 7in display can be used either as a conventional clamshell configuration, with the screen inside the lid, or as a tablet player with the mechanism behind the screen. The new model has a six-hour battery life, and comes with a 'smart car mount' – it presumably also fits other brands of car – and both mains and 12V chargers. Two speakers are built-in, along with twin headphone jacks, and there's also a remote control, an SD memory card slot and a USB input. As well as DVDs and CDs, the Philips can also play CD-R/RW, DVD+/-R/RW, Video CD/SVCD, Divx, MPEG 4, MP3 and WMA.